We hardly go out to eat Bengali food. provided a chance I would say I hate eating the same old same old food that we eat everyday at home. for me eating out is a break from monotony...a respite from routine and I need a good spread at a great place that will present itself with much promise. 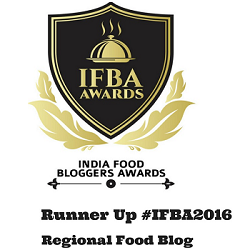 a promise to ignite my senses and provide something new in terms of flavour and taste. But growing up it was never the same. In my first eighteen years of life I can count the times we went out to eat as a family. It was those days when fresh home cooked food were considered 'the best' for everyone and women dished out steaming hot fresh food twice daily. In the small town that we grew up we hardly had good restaurants to dine out as families and take always were totally unheard of. 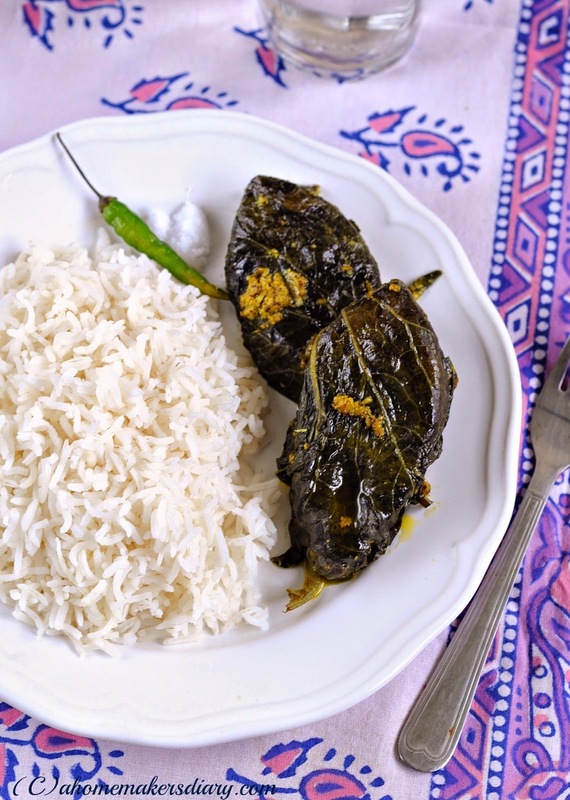 The hotels that housed people on their tours and travels served Bengali meals of dal-bhat-maach (rice-lentil and fish) but was far from being exotic. Even in bigger towns Eating out was rather luxury, to mark an occasion or celebrate something special. It was those days when people spent their resources wisely and as kids we craved for special treats for days, sometimes for months before getting a taste of it. and when they were given we valued them as little treasures. The highlight of taking a train and travelling out of our little station was a little treat that were promised by the parents. A treat as simple as a cup of kwality ice cream at Howrah station which was not available in our little town. We would discuss which flavours to choose on our journey and chomp on the luchi and alur dom that maa used to carry on travel. then would relish the ice cream in between bouts of happy giggles. And may be thats the reason demands were small, pleasures were simple and joys knew no bound. 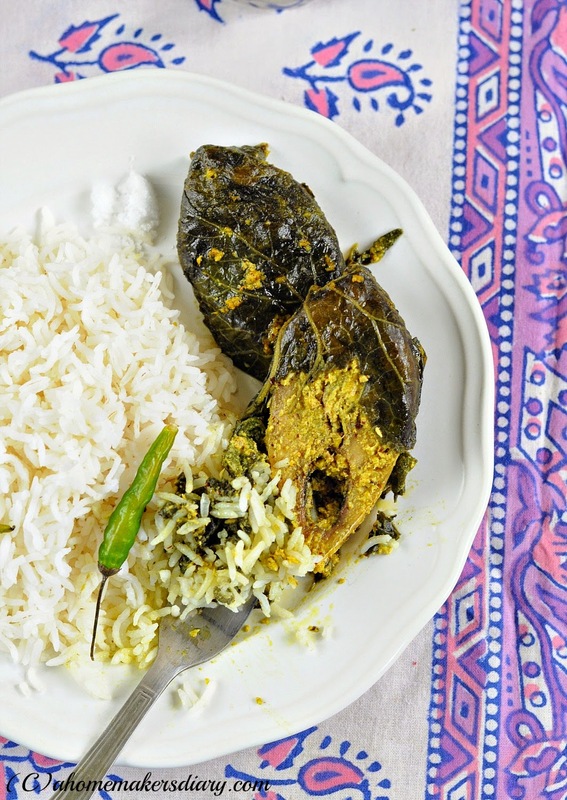 This Kumro patay Ilish is a family recipe which I changed over time as per my taste. At home this is called paturi as in my home paturis are mostly cooked in edible leaves, not banana leaf. Flavours are to cherish not to waste. While a popular restaurant in Kolkata uses garlic and mango pickle I use Am-Kasundi (mustard sauce with raw mangoes), to bring in little tang from the preserved mango in it. Clean the Hilsa steaks drain the excess water and keep aside. Mix all the other ingredients and make a smooth thick paste. Place the Hilsa steaks in it, coat and keep aside for 30-60 minutes. Once you are ready to cook. Wash the pumkin leaves under running water. Heat a bowl of water and dip the leaves in them for a few seconds to make it pliable. Shake out all the excess water. Take 2 leaves per steak and smear little mustard oil on it. 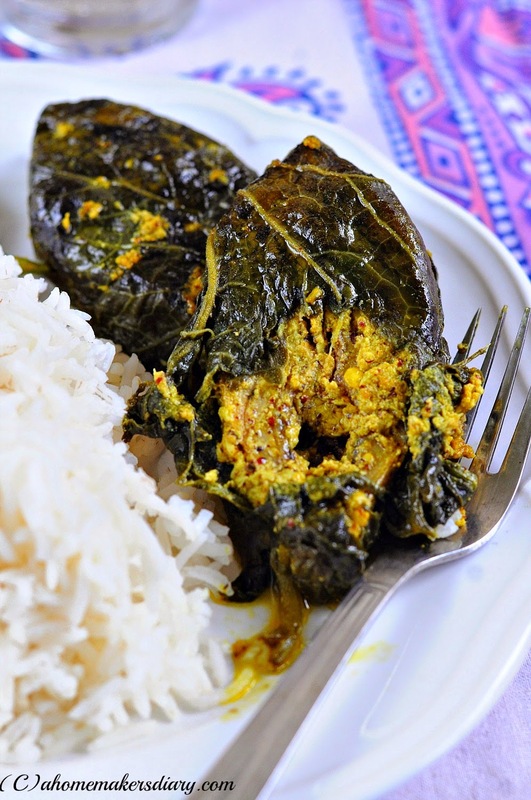 place a piece with the spice paste in the middle and gently fold the leaves on it. Make sure it's covered properly hence the juice would leak out. Steam them in a steamer (bamboo or the metal ones) for 15 minutes. To steam I used my pressure cooker and the stacked pans that come with it. 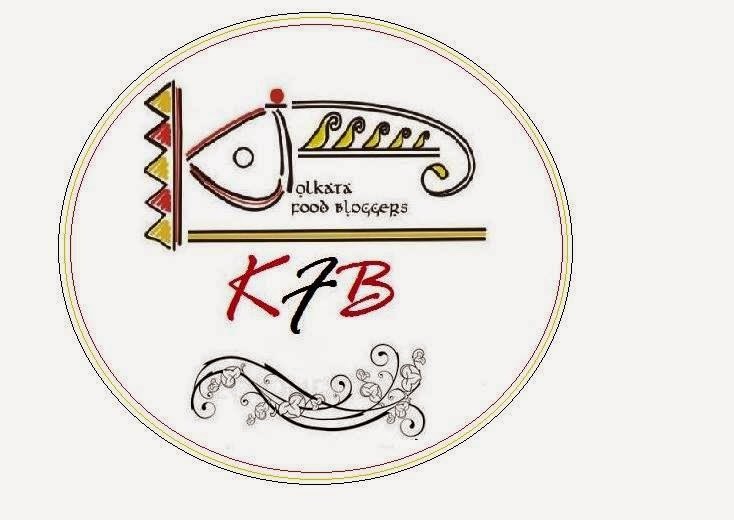 You can use regular steamer, bamboo steamer, microwave, idli steamer etc. In case you dont have any of these try placing a metal mesh on a pan. Pour water in the pan is such a way that it does not touch the mesh. Layer with banana leaf and place your wrapped fishes on it. Cover with a tight lid so that the steam does not escape. cook for 10 15 minutes. 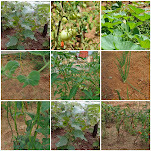 you can use any other edible gourd leaves like bottlegourd, ash gourd etc. 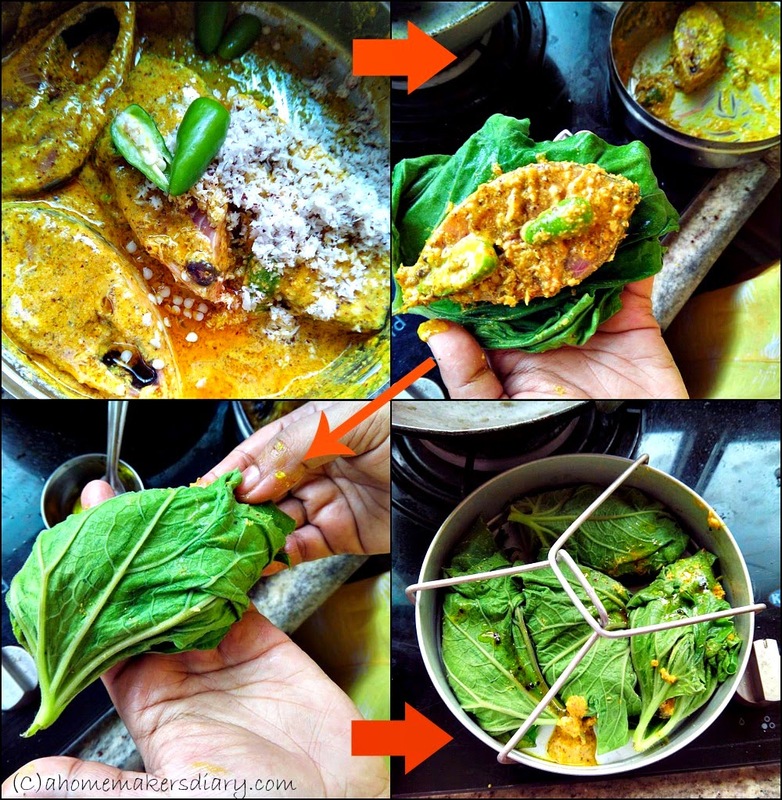 If edible leaves are unavailable use Banana leaf. If kasundi is unavailable use mustard paste and little bit if raw mango paste. Adjust the amount and seasoning as per your taste before putting the fishes in.